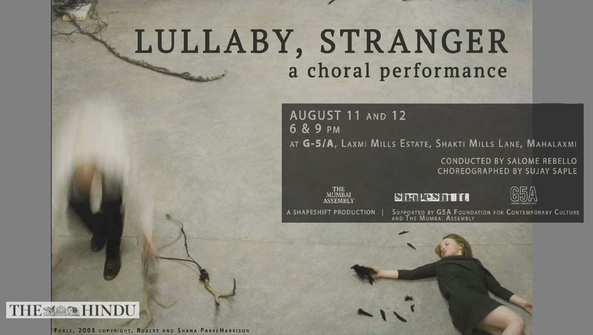 True to its name, the Mumbai-based Shapeshift Collective conjures up yet another unusual arts venture - a choral performance with a difference titled Lullaby, Stranger . Attempting to break the mould of traditional concert presentations, the setting of the show will be a dimly lit chamber with mattresses strewn over the floor. Those in the audience would select one ‘bed' each on which they would spend the roughly one-hour duration of the performance ‘lying down'. As the advisory explicitly states, ‘Sitting, standing, moving around or talking is not permitted.' All those activities will be the sole preserve of the singing ensemble who will walk around throughout, their caressing voices shifting from one pair of ears to the next, creating an aural experience of intimacy and distance that is none too typical. Wielding the baton will be Jerusalem-based conductor Salome Rebello, while Sujay Saple is the choreographer of the piece.‘Sleep and watch' performances are not entirely unknown. Since 2015, Max Richter's durational performance of more than eight hours, Sleep , in which audiences ‘sleep' along to classical music performed by a live orchestra, has become an international sensation.